Crystals of cerium-doped gadolinium–gallium–aluminum garnet have been grown by the Czochralski method. 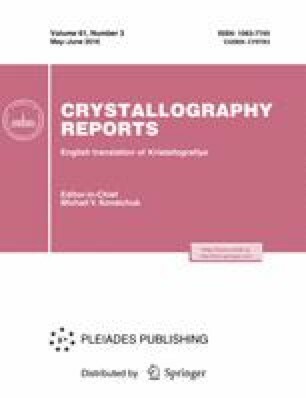 The transmission and reflection spectra of these crystals in the wavelength range of 250–800 nm have been obtained by optical spectroscopy. Refractive indices are calculated based on the measured Brewster angles, the experimental results are approximated using the Cauchy equation, and a dispersion dependence is obtained. Original Russian Text © N.S. Kozlova, O.A. Busanov, E.V. Zabelina, A.P. Kozlova, V.M. Kasimova, 2016, published in Kristallografiya, 2016, Vol. 61, No. 3, pp. 457–461.